The Sugarbush is large evergreen shrub, growing to be massive bushes. 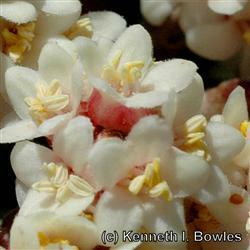 These fast growing shrubs have large green, leather that have a slight fold at the mid vein. The small, tightly configured flowers grow in a panicle style, fading from light whitish/pink to dark red. The flowers develop into small red berries that bring vermine and ground life to make nest amongst its branches. The Bush can be quite large and are often required to be cleared away around the home, due to the large sap content in its wood.